The post Soldiers Killed In Boko Haram Attack In Chad appeared first on Channels Television. Eight Chadian soldiers died in a Boko Haram attack in the Lake Chad region on Wednesday, with 48 jihadists killed as the army retaliated, a military spokesman told AFP. “Boko Haram terrorists attacked defence force positions in Kaiga Kindji early this morning,” the spokesman said. The attack, which left 11 other soldiers wounded, had been “vigorously” repulsed, he added. Boko Haram’s Islamist insurgency has devastated the Lake Chad region since the group took up arms in Nigeria in 2009. The jihadists’ campaign of violence has left at least 27,000 people dead, displaced some two million others and triggered a humanitarian crisis. 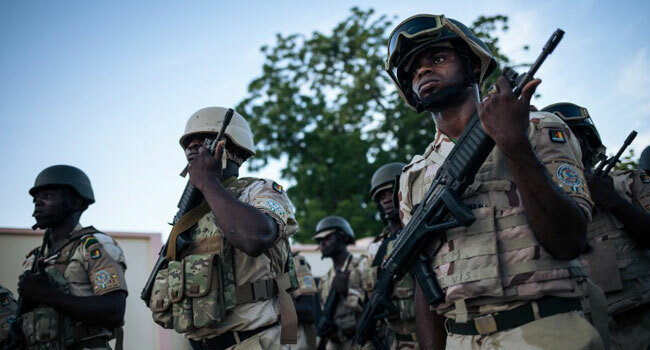 Chad, Cameroon and Niger have all joined the military effort by Nigeria to crush Boko Haram. Chad has seen a recent increase in attacks by the group. A Chadian soldier was killed earlier this month after Boko Haram launched a mortar attack on a military camp in Litri, close to the Nigeria border. In late September, six people, including two soldiers, were killed in another Boko Haram attack on the Chadian shores of Lake Chad, in which 17 of the attackers were shot dead by the army. The Nigerian army has recently intensified operations in the Lake Chad region, including air strikes against the jihadist group, according to Nigerian military sources.